The transparent front allows a direct view of the flowing coolant. Wether you choose the large reservoir for two 5.25” drive bays or the more compact model for one 5.25” drive bay you will always receive an exceptional product which will support your cooling concept. The design of the reservoir is also well thought through. The PLexi I extra strong and very thick which further aids the stability and durability of the reservoir. A separating plate is integrated in the middle of the reservoir to force the coolant to flow thourgh the whole of the reservoir for better deaeration. The filling opening, sealed with a black nickel cross-slotted 3/8” screw plug, is integrated in the front third of the reservoir. By simply pulling out the reservoir the system can be filled. This process is made even easier when using a Fillport! 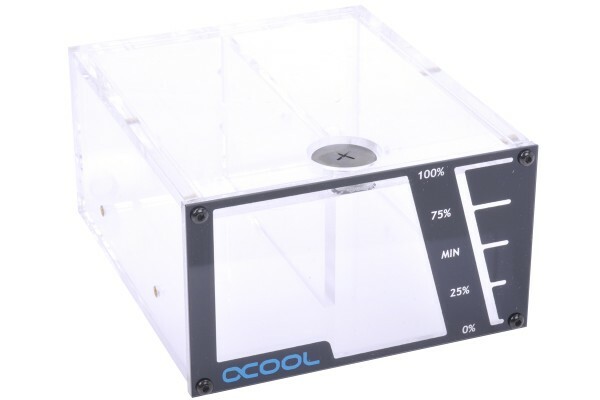 Important Note: Please note that the firm Alphacool International GmbH accepts no liability for damages of this product by using other coolants. We would like to point out that other coolants as inhibitors often contain alcohol or other corrosive substances attack the acetal, please only use our Cape Kelvin Catcher. Kann die Front hier abgenommen werden, ohne den AGB damit zu öffnen, um den AGB quasi in eine Gehäusewand integrieren zu können? Ja die Front kann abgenommen werden ohne den AGB dabei zu öffnen.